In 2016, the United States Food and Drug Administration (FDA) announced new guidelines for the Nutrition Facts labels. Several changes were made such as the reporting of added sugars and reporting based upon the container size and “reference amounts customarily consumed”, or RACC. The changes were made to help consumers make more informed dietary choices. Many products on the shelves already contain the new label information. All manufacturers must be compliant by 2020 and 2021 (see FDA Proposes Extension for Nutrition Facts Label Rules). 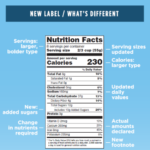 ProductVision’s Nutritional Labeling module will generate fully-compliant Nutrition Facts labels based upon the current regulations. Many formats are supported including vertical, horizontal, simplified, infant, toddler, linear and supplemental. Two product labels (i.e. cereal/milk, mix/prepared) can also be generated. Part of the implementation of the new labels is also educating the consumers of the information presented. The FDA will be launching an educational campaign by reaching consumers with educational videos, social media, and user-friendly websites. Having educated consumers can help them improve their health through diet and nutrition. The goal is to help them see how daily dietary choices can impact their health and how diet can impact their own and their family’s health.